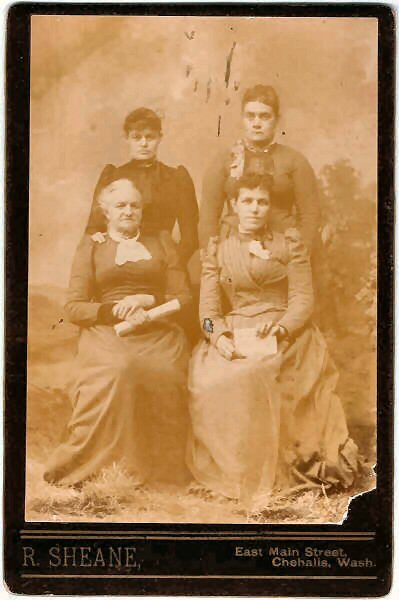 Comments: Family Group - Women Aunt Eliza Zuendel (Nee: ) | Erie Pa USA | | Comments: Aunt Eliza or Eve Elizabeth Zuendel Root is the top left woman in the picture. The others might be her daughters Lovina, Samantha, and Sarah or perhaps a daughter-in-law. This photo album was submitted by Karen Zindel Sutton. Karen writes, This album is of the Zuendel/Zindel's of Erie and Forest Co's, PA. The pictures must all be relatives or descendants of the original family of Johann Heinrich Zuendel b 1787 and Dorothea b 1799.